This tutorial will show you how to make a killer Fashion Model Poster using basic Photoshop functions like Layer Styles, Vector Masks and Filters like Motion Blur. At a time when there’s more DOWNLOADING of source material than actually USING it, this tutorial will get you through the end with only three stock images—two if you have experience with Cinema 4D. Also, instead of the monotonous step-by-step form of tutorials you find all over the net, I’m using a different approach. Basically I’ll be explaining each effect separately so that you can use this elsewhere and not restrict yourself to the final image here. This tutorial has two main divisions. Part Two – The model & effects. Each effect will be explained separately. So let’s get our hands dirty! Lets start with a new document, sized 1200 x 1600 px. 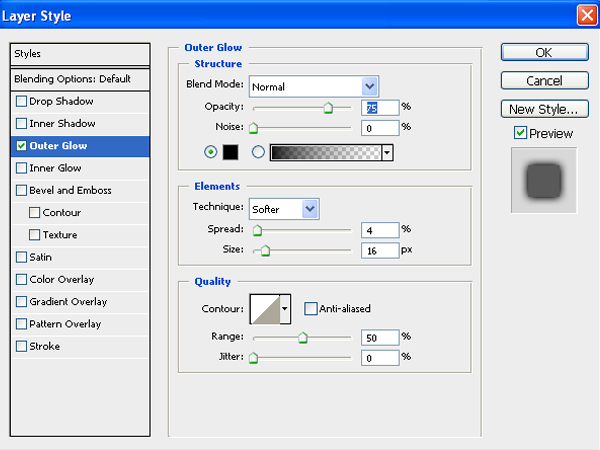 Press D to set the default palette colors as Foreground Black & Background White. Press Alt + Backspace to paint the background black. Within this new ‘clouds’, Group make a new layer . 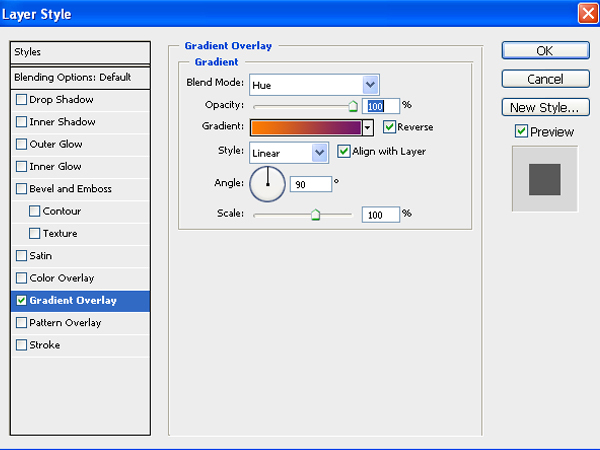 Select the Gradient Tool(G) and apply a linear gradient going diagonally. 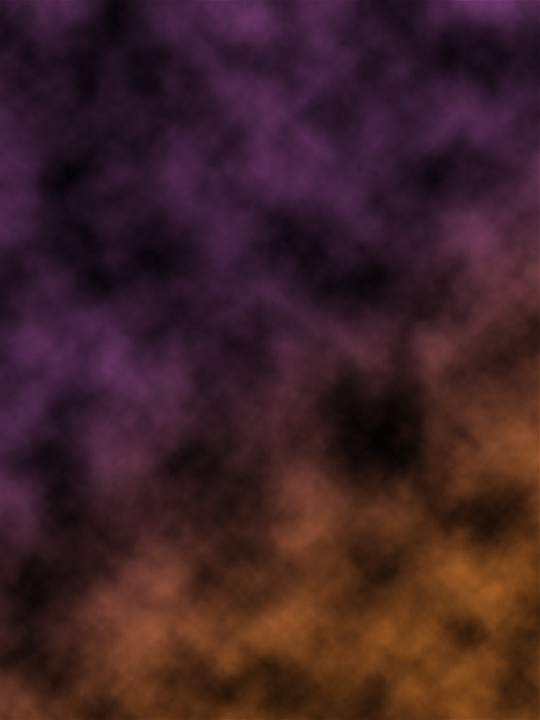 Use the colors Orange (#fd7c00) and Purple (#6f156c). 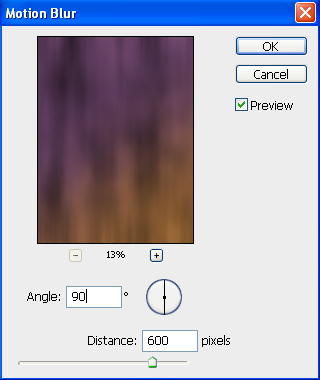 Reduce the opacity of the layer to 65%. Next, Merge (Ctrl+E) the group. Duplicate this layer. 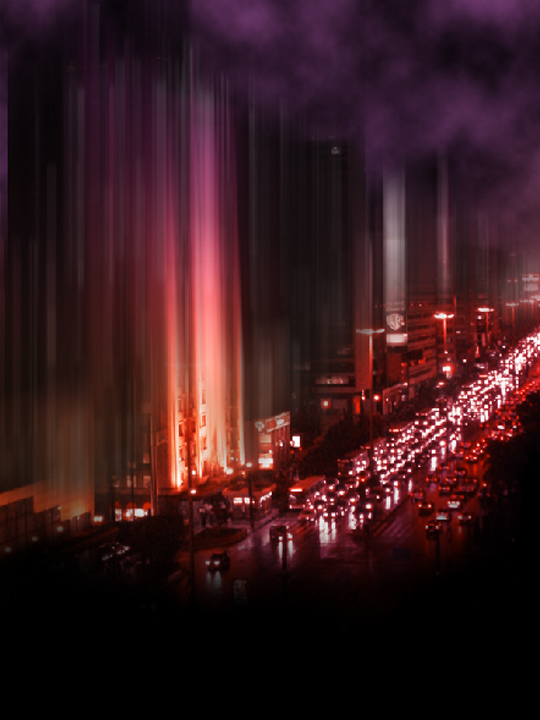 Go to Filter > Blur > Motion Blur with the following settings: Distance: 600 and Angle :90. 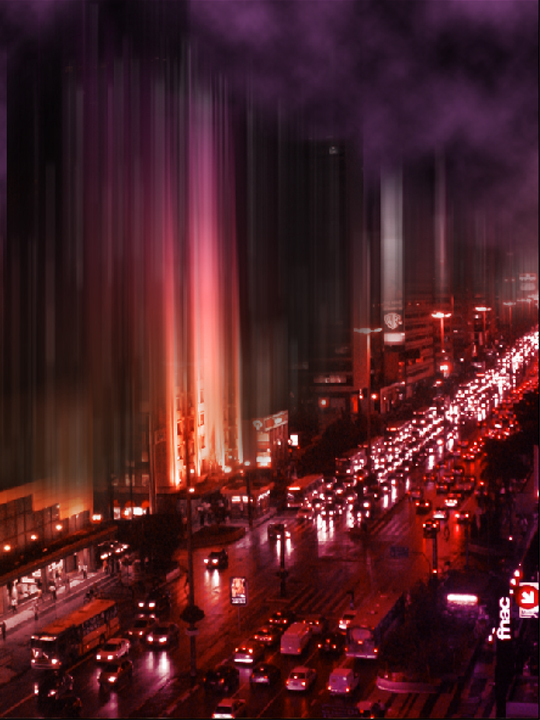 Now let’s bring in the main city element of our background on to the canvas. Found this stock photo on sxc.hu. Remember – you don’t have to shrink the image for it to fit entirely in the canvas. Our objective is that the main yellow building should occupy a significant amount of space in the canvas, towards the left side. Now using the Lasso Tool (L) or simply Brush (B) , chuck out excess portions of the buildings (sky). You can use a Soft Brush(Hardness: zero) at the end to make things a little smooth. 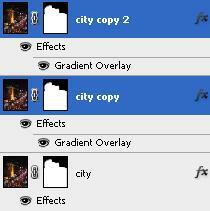 Merge the two copies so that the vector mask gets applied and layer style vanishes. 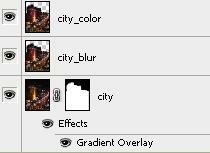 Name the upper layer ‘city_colour’ and the lower layer ‘city_blur’. Follow? Look at the screen shot to clear doubts. 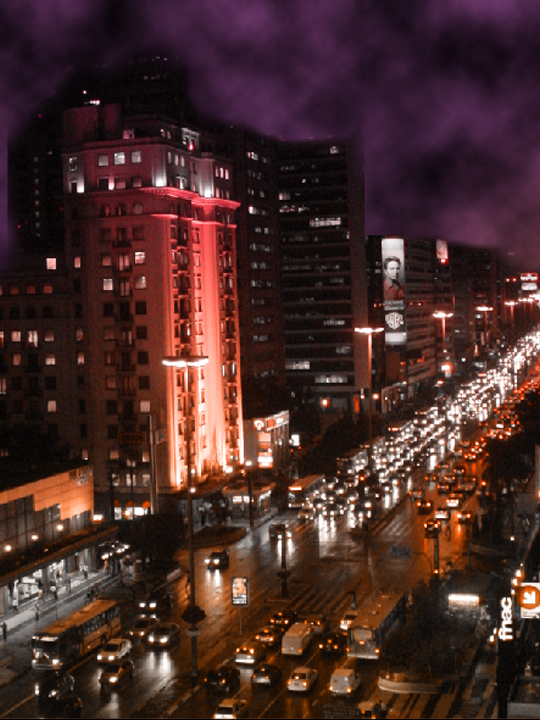 Apply a Gradient Overlay by going to Layer > Layer Style > Gradient Overlay with the following settings: Blend Mode : Overlay, Opacity : 75%, ‘Purple – Orange’, Angle : 120 degrees. 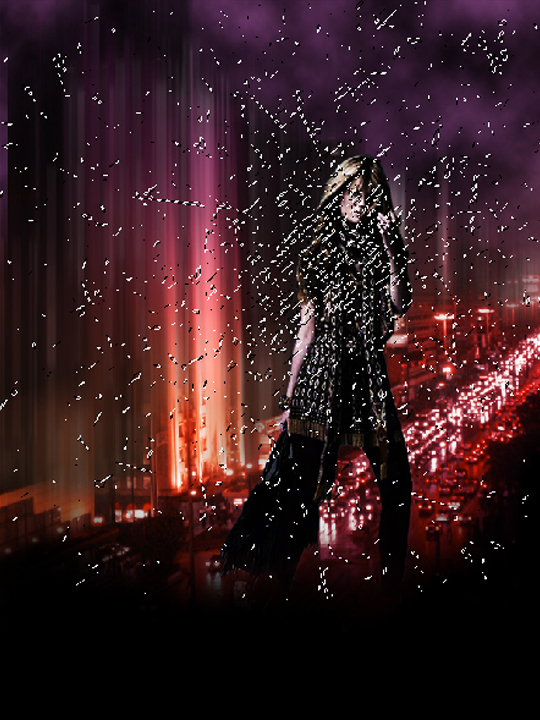 Apply a Vector Mask(Reveal All) and paint black over all those parts where you’d like to see the motion blur effect. 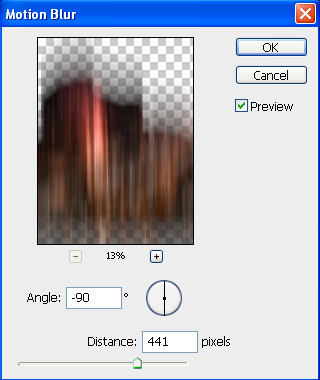 Since after applying a motion blur, the extreme ends become transparent, copy this layer(Ctrl+J) a few more times to extend the blur and then merge it. You can add a vector mask on the blur layer to make minor adjustments. This is the end of part one. Now lets bring our model into the picture. I got this particular picture while browsing the model’s personal website. You can take any picture you want. Using the Pen Tool (P) – always my first preference for extracting figures – to make a path around the model. No need to try and include every strand of hair – just go with the general direction of the head. Once path is complete, right click on it and select Make Selection. Feather = 0, Anti-aliasing ON. Now that we have the marching ants ( yeah, that’s what it’s called ) around the body , just use the Move Tool (V) to bring it on to our canvas. 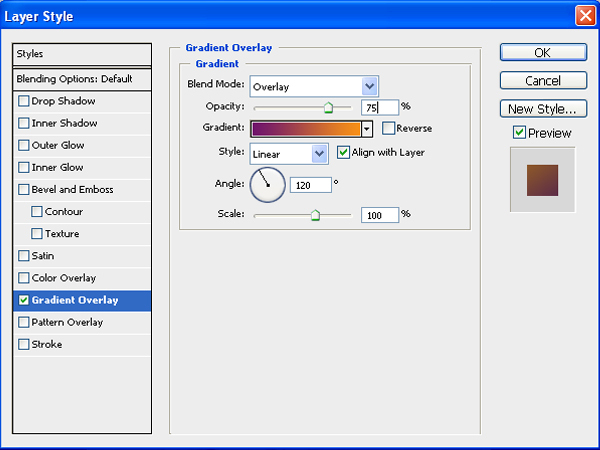 Place it above all other layers and resize (Ctrl+T) it appropriately. Make a Group called ‘Model’ and place her inside it. 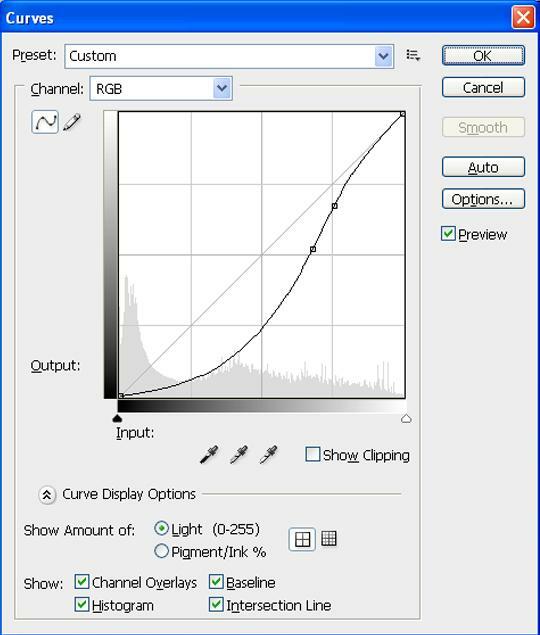 Click Ok and replicate the curve shown below. Next, hold Alt and move the mouse between the two layers. When you see the cursor turn into two overlapping circles, click. Now the curve will affect only the model. This effect will make all small extraction errors disappear. If you still spot something wrong, just add a vector mask and using a soft brush remove it. Merge the Curve with the model. This is really a clever trick to give the model a grungy feel. The shattered pieces is actually a Cinema 4D render. 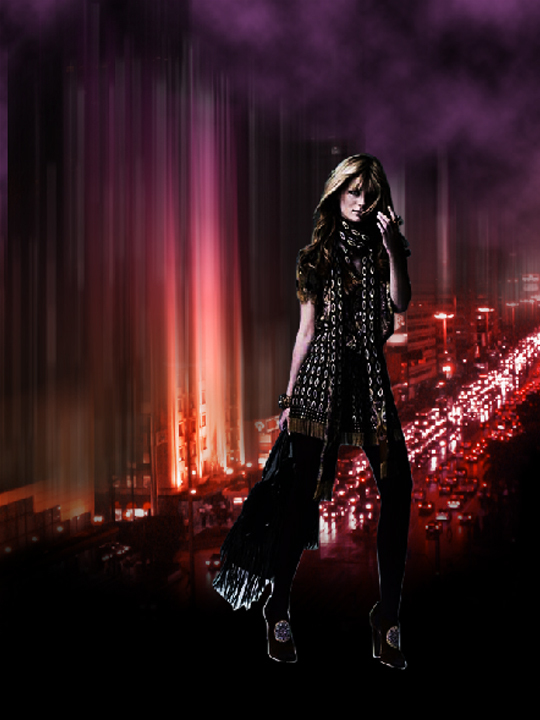 You can do it yourself or just download several such renders from sites like planetrenders.net. Bring the ‘pieces’ on to the canvas. Let this be below the model. Hide it. Press Ctrl+ click on the ‘pieces’ thumbnail. This makes a selection of the pieces. Now keeping the model layer selected – press Ctrl+J. This will make a copy of the model BUT only the small shattered like parts. 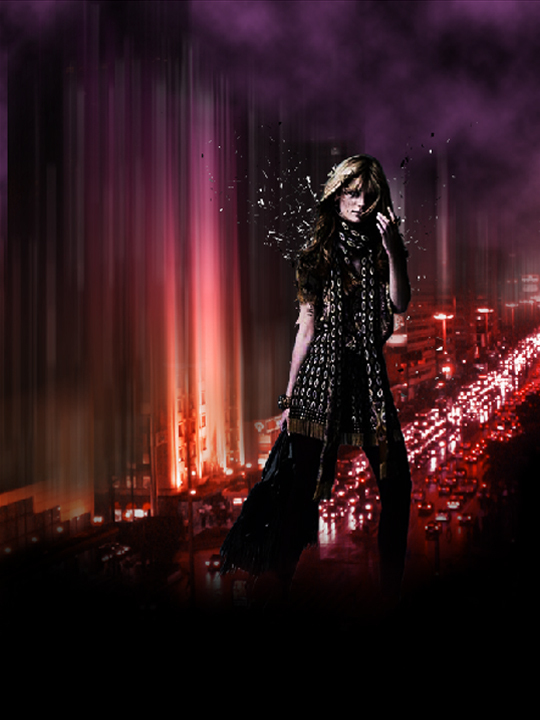 Now simply with the Move Tool (V) shift the layer slightly left and watch the neat effect. Create a Vector Mask and with a Hard Brush (Hardness 100) paint over the areas where you don’t want the scratches. The ‘wings’ shattering effect isn’t very difficult. It’s just about using your common sense. We already have a ready-made shatter BUT in the shape of a blob or circular splat. So what we do is simply place it behind the model and apply a vector mask, then with a Hard Brush just paint on the sides to acquire the shape. Do this for each ‘wing’. Make such an extraction on both sides. You can also select a part of the model and move it. 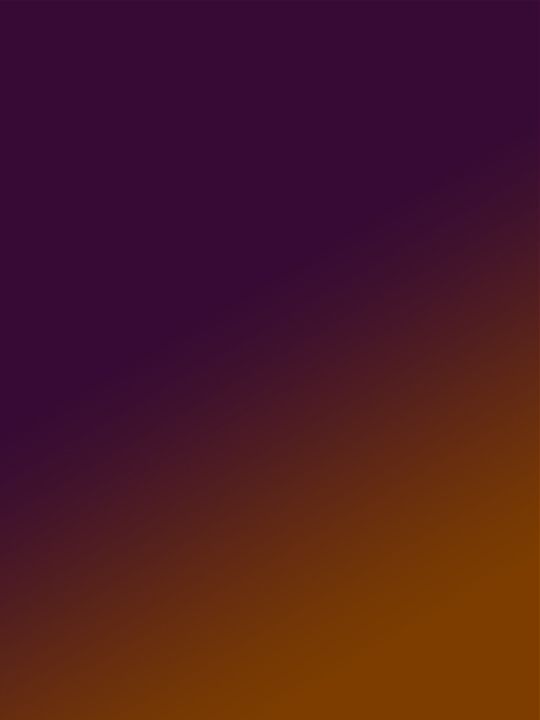 The idea is to move a part of the image but to keep it ‘close’ to the original positions to show the similar colours so that it appears that it’s moving out. Here’s the final set up of layers to clear any doubts.